Last week we went to Brighton for a few days as a Christmas present from Karl to me. We went to the beach and pier to take some blog photos when it starting hailing really hard so this was all we managed to get. I would like to get some more photos soon so you can see more of this coat. I bought it last October in Topshop and although a few of my friends hate it and say it’s the worst coat they’ve seen, I’m in love with it. Even if I do look like a carebear! 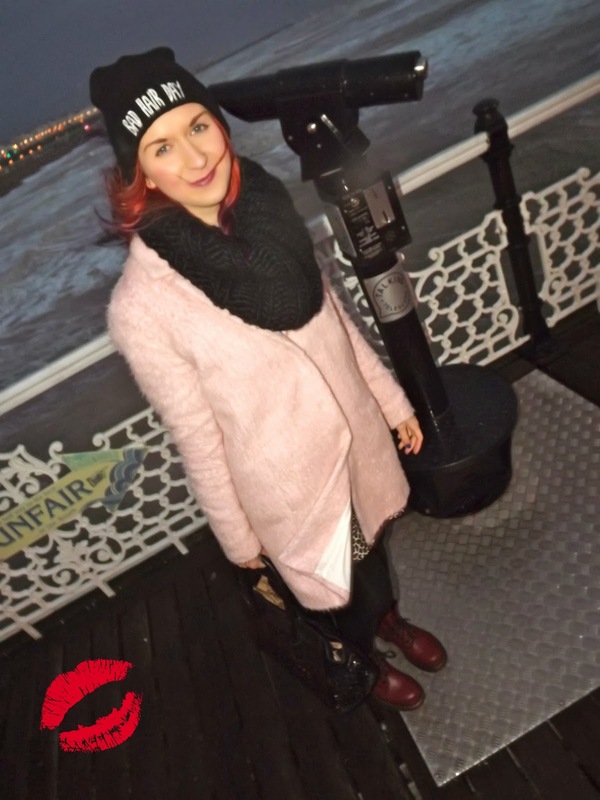 It was so windy that I had to keep this hat on so my hair wasn’t constantly in my face all the time! I had such a great few days, spent 373 arcade tokens on Haribo, went to my favourite cocktail bar Be at One for happy hour and had dinner at an American diner, Vietnamese restaurant, Choccywoccydoodah and we saw Last Vegas at the cinema. We also shopped a lot…but I bought nothing! Don’t worry, I made up for it the week after when we went to London and spent way too much in Zara and Topshop and ordered things from Missguided, Motel Rocks and eBay!